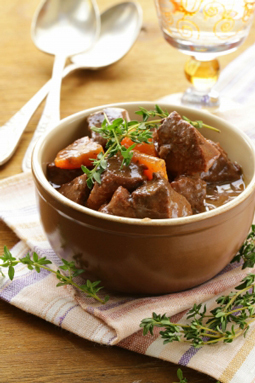 Creamy Beef Stew with Mendocino Mustard - A recipe from Savor California, the online showcase for extraordinary gourmet foods and beverages from California. Add shallots, carrots, potatoes and tomato paste and stir. Pour in broth and simmer for 90 minutes. Stir in cooked bacon, mustard and cream. Garnish with a scattering of parsley or sprigs of thyme.